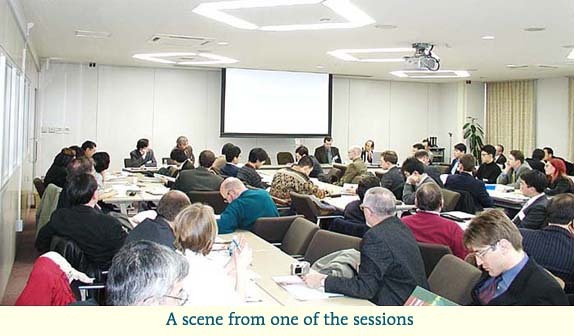 The first international symposium sponsored by the 21st Century COE Program "Making a Discipline of Slavic Eurasian Studies: Meso-Areas and Globalization" was held from January 28 to 31, 2004. The title of the symposium was "Emerging Meso-Areas in the Former Socialist Countries: Histories Revived or Improvised?" As a new activity, on February 1, we organized the International Workshop by Junior Scholars. Twenty-two foreign scholars were invited from nine countries (Russia, Ukraine, USA, UK, Estonia, Belarus, Lithuania, Poland, and Armenia) and two unrecognized states (Transnistria and Abkhazia). More than 125 scholars living in Japan participated in these events. As a whole, 33 papers were presented. The discussion was mainly held in English, and interpretation from English to Russian was provided. We proposed the concept of meso-areas as applicable not only for Slavic Eurasia but also for other territories. Therefore, the representatives of other area studies (Islam, China, Europe and others) were invited. The conceptualization of meso-areas is closely connected with the task to develop Japanese Slavic studies into Slavic Eurasian studies. For this purpose, the symposium focused on the Baltic and Caucasian countries, Moldova, and Belarus, which have not been studied in depth in Japan. The symposium also brought attention to current issues, organizing papers on the problems of unrecognized states and Islamic radicalism. Four young foreign scholars (from Russia, USA, Ukraine, and Belarus) were invited to give papers at the International Workshop. Young speakers from Japan were selected through open competition. Most papers will be published in a collection forthcoming in early 2005. Several papers will be published in the next issue of Acta Slavica Iaponica and a collection on Russian imperiology, forthcoming in mid-2005. "Regional Identities and Meso-Mega Area Dynamics in Slavic Eurasia: Focused on Eastern Europe"
"Is It Easy to Globalize the World? The Expansion of the Shengen Territory and Freedom of Movement in a Wider Europe"
"On Sails and Gales, and Ships Driving in Various Directions: Post-Soviet Ukraine as a Test Case for the Meso-Area Concept"
"Empire or Post-Empire? The Concept of 'Long Century' and the Consequences of Globalization"
"The Baltic States: Histories Both Revived and Improvised"
"Russian-Speaking Minorities in the Baltic Countries"
"Ukraine's Gastraders: A Case of Political Economy in a Transition Country"
"The Reserves of the Policy of Social Populism in Modern Belarus"
"Values and Democracy: Moldova in Comparative Perspective"
"Radicalization of Islam in Daghestan"
"Islam and Ethnicity in Daghestan"
"Abkhazia under the Conditions of the Redivision of the World"
"Nagorno-Karabakh: Historical Background, Current Challenges and the Possible Role of the International Community"
"Legitimacy of the Political Authorities of the Pridnestr Moldova Republic: Sociopolitical Aspects"
"The Russian 'Double-Faith' (Paganism and Christianity): The Historical Aspect"
"Poland: Between Imperial Temptation and Anti-imperial Function in Eastern European Politics (from the eighteenth to twenty-first century)"
"From Ethno-Centric to Civil History: Changes in Contemporary Lithuanian Historical Studies"
"Tatar Identity: A United, Indivisible Nation?" "Volynia under the Russian Empire: Migration Process and Cultural Interactions"
"German Elitism in a Populist Empire: The Ostzei Question in a Comparative Perspective"
"Russian Government, the Baltic German Elite and the Estonian Public During the War and Revolution 1914-1917"
"The Object of the Most Tender Feelings: Native Spirituality and Siberian Regionalism, 1860-1920"
"The Most European Science in Russia: Defining the Empire Anthropologically"
"Chuvashi at the Confessional Crossroads: the Problem of Choice in Faith and Ethnic Identities in the Writings of Chuvashi Authors, the 19th – Early 20th Centuries"
"When Do Elites Compete? The Determinants of Political Competition in Russian Regions"
"The Central-Republican Relationship and Party Elites in the Soviet Union: Kazakhstan (1970-1991)"
"Will the Ukrainian Parliament Counterweigh Superpresidentialism?" "Making Politics, Undoing Empire: Political Reform in Russia at the Beginning of the 20th Century"
"The Development of an Imperial Representation of Russia in the Civil War: The Case of the Moscow Bolsheviks"
"Workers Tell: Representation of Personality in the Compilation of 'Histories of Factories' During the Stalinist Era"
"The Representation of the Belarusian Language in Contemporary Belarusian Literature"
"Peculiarities of the Integration Process Between Belarus and the Russian Federation: Economic and Political Aspects"
"The Availability of Soviet Statistics for Analyses of Ethnic Problems: Russia, Ukraine, Central Asia, and the Whole Union"